Turn your ordinary chicken nuggets into something extraordinary. 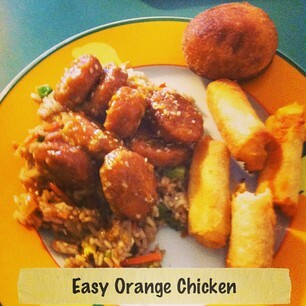 This is an easy orange chicken recipe along with a fried rice recipe. Mix all in a 1 quart sauce pan. bring to boil, thicken with cornstarch diluted in water. Add sesame seeds. reduce heat and keep warm. Deep fry nuggets according to package directions. Drain nuggets on paper towel, then place into mixing bowl add sauce and stir well. Serve over rice. After veggies start sweating add 6oz. frozen peas and cook until hot. In large fry pan, add 2 table spoons olive oil and 3 eggs (slightly beaten), cook until eggs are 1/2 done. Add rice, veggies, and 1/4 soy sauce to fry pan and cook on low for 10 minutes. Serve hot. This looks like my kinda meal! Great job! I am stopping by from Inspire Me Monday Blog Hop! I look forward to your visit at http://www.homemaker-mom.com/2/post/2013/07/old-boxes-with-a-new-purpose.html . Happy creating!